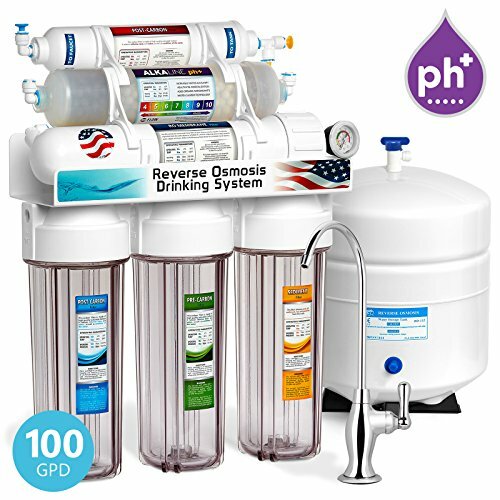 The Express Water ROALK10DCG 10 Stage reverse osmosis filtering system is a good and small system you will be able to install by yourself in a standard kitchen counter cabinet. In the following article, we review the pros and cons of using this filtration system, and we take a closer look at its efficiency, filters, and installation. The 10-stage filtration might seem like a lot, comparing them with the products developed by the competition, which usually provides only a 5, 6, or rarely 7-step filtration. This happens because Express Water counts every stage of the mineralization as a separate stage of the filtration process itself. While this is a good marketing scheme, the filtration process isn’t actually very different from what you can find at the competition. Installing the Express Water ROALK10DCG is quite simple. Most of the elements are color-coded, so you’ll be able to tell which component comes where. The instructions manual provides useful information, and you will be able to follow the guide with ease. One of the advantages of using this RO system is that the water produced has a great taste. Even though the 10 filters story is just a marketing scheme, we cannot deny that the mineralized water tastes great. Another advantage is that this filtration system comes with a nice looking faucet. The faucet is capable of delivering a water flow rate of 0.8 GPM, and it’s really nice looking. The Express Water ROALK10DCG is considered to be very efficient. Some people might find it hard to believe that a filtration system that wastes 2 gallons of water for every gallon of pure water it produces like this one is efficient, but there are reverse osmosis systems that can use up to 20 gallons of water for every filtered gallon. 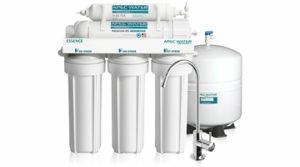 When an RO system uses 4 gallons of wastewater for a gallon of pure water, it’s considered efficient. With a wastewater pure water ratio of 2:1, this unit is very efficient, ranking among the best units available on the market. 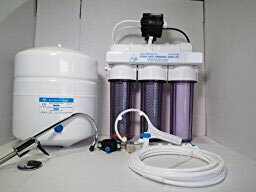 As with every reverse osmosis system, filters are very important. This system is marketed as having a 10-step filtration sequence, but this is not entirely true. The first 5 steps of the filtration process are exactly the same as you can find when using other models available on the market, but things change at the sixth step. Most manufacturers count the remineralization of the water as a single step in the filtration process, but Express Water does not. Instead, they count every step in the remineralization as a separate step in the whole process, thus the increased number of total steps. The filtering steps are as follows – 1st step is sediment removal. This is where the larger and finer particles in the water are removed. Sand, rust, dirt and other components are blocked from going farther. The second filter removes organic compounds, chlorine, odor, and tastes from the water. The third one further removes any tastes and odors, but it will also remove common chemicals and volatile compounds. The fourth stage is actually the reverse osmosis membrane which will stop any particles larger than 0.0001 microns, including chemicals and bacteria. The fifth stage will make the water more alkaline, improving its taste. The sixth step is separated into 4 different smaller steps, but its role is to remineralize the water. The filters are easy to install and change. They are color-coded, so you will always be aware of which one goes where, which is especially important since there are a lot of them. Installing the Express Water ROALK10DCG is not difficult, and people who are often involved in DIY projects will be able to finish the installation in under two hours. The toughest part of the installation is to fit every filter in its proper place, and this operation is made easier thanks to the color coding on each recipient and each filter cartridge. The installation instructions provide a step-by-step guide for the installation. The instructions are clear and concise, making them very easy to follow. A good addition is the pressure gauge. This gauge will allow you to monitor the operating pressure in the water at all times. Great Taste – Despite the somewhat exaggerated marketing, one thing is for certain. The water produced has a great taste, and nobody can deny that. Good Installation Instructions – The installation instructions are clear and easy to follow. Even if you don’t have previous experience with DIY projects, you will be able to install the RO system by yourself. Nice Looking Faucet – This system comes with a nice looking faucet which will make a good addition to most kitchens. Exaggerated Marketing – The 10-step filtering process is, in fact, a normal 6-step process with water remineralization.